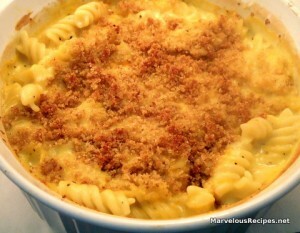 Everybody loves mac & cheese and this recipe is especially good! At least my family thinks so! Try it tonight and watch how fast it disappears from your dinner table! 1. Stir the soup, milk, pepper, cheddar cheese and pasta in a 1-1/2-quart baking dish. 2. Mix the bread crumbs and melted butter in a small bowl; sprinkle over the pasta mixture. 3. Bake at 400 degrees F. for 20 minutes or until hot and bubbly. Makes 5 servings. Looks and sounds delicious. Never thought of fixing Mac and Cheese this way. Very creative.